Who doesn’t love a good card game? Whether you’re looking for something to keep the kids occupied or a fun way to kill some time in a waiting room, the perfect card game is out there. All you have to do is find it. And with mobile apps, it just got that much easier to find the card game to suit your needs. Now you can play cards wherever you are, and you don’t even need to carry a deck with you. To help you get started, we’ve put together a list of the top 5 free card game apps. I must apologize that most of them are for the iPhone, as I am a definite Apple fanboy. Either way, get ready to experience cards in a whole new way. For those with an iPhone, this app is one of the most complete solitaire packages out there. Solitaire Deluxe comes with a selection of 16 different games. 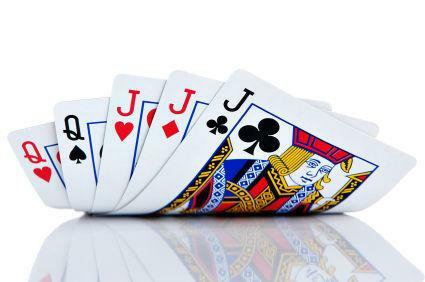 These include Windows Solitaire, FreeCell, Spider, Chinese Solitaire, Russian Solitaire and many others. Players have the option to customize all of the games to their liking. There are also easy-to-understand tutorials for each game making this app one that’s not-to-be-missed. If you’re looking for something a little different, you should give Speed Card Free a try. This is a fun and easy card game. The aim of the game is to get rid of all your cards, regardless of suit, before the computer player does. This game is very fast-paced so you’re going to need all of your focus to win. The app is compatible with iPhones, iPads and even the iPod touch. Blackjack 88 for the iPhone is an app that will give you an authentic Las Vegas experience. The graphics and animations are optimized specially for mobile devices ensuring a high-quality, authentic “gambling” experience. It’s really easy to use and is perfect for anyone who wants to brush up on their blackjack strategy while on the go. For all the FreeCell fans out there, this is the app for you. This isn’t a demo version like so many of the others but rather the full game. There are four different difficulties to accommodate beginners and experienced players alike. With this app, you decide how much you want to be challenged. The graphics and design are cool for a card game, making it a very worthwhile experience. For those who are new to the game, the app comes complete with rules. It’s available in English, French and Dutch and is compatible with both iPhones and iPads. This app, for android devices only, is a card game package which includes classics like Solitaire, Free Cell, Forty Thieves, and Spider. With over 3000 downloads so far, you can rest assured that these games are of the highest quality. This app will give you a Solitaire experience unlike any other if you are running Android OS. Take your card habit to a new level and give one of these apps a try. They will not only ensure that you have hours of fun playing your old favourites but will give you the opportunity to discover new games. Playing cards has never been simpler or more convenient thanks to these card game apps. At the end of the day, you will agree that apps have changed how you experience card games forever. I love FreeCell! I used to play it a lot. My record was 5 wins. Thanks for sharing this. Also check out CardWar -This is a good classic card game war, for the iPhone and iPod Touch.